As summer draws to an end, we at Catering by Seasons have a mass of basil crops in our garden, ready to bolt and grow flowers. Since basil is an annual that cannot survive our harsh winters, there are only a few options to get the most out of these delicious herbs. It is possible to break off a portion of the plant and grow new roots indoors for the winter – see how here. Otherwise, we can dry some and make a lot of fresh basil dishes. One of our favorites – basil pesto. 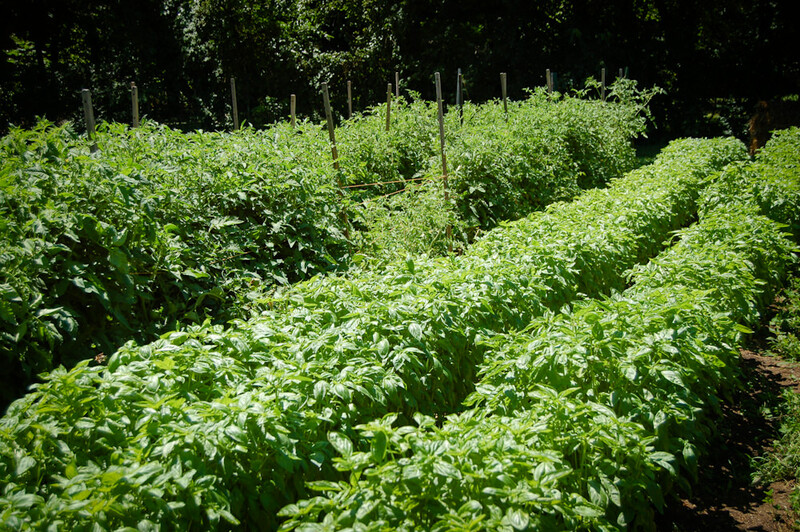 Our urban garden produces enough basil each summer to produce a year’s supply of pesto! Try our recipe at home, and freeze whatever you don’t use. Puree basil with olive oil. Set aside. Puree pine nuts and walnuts. Mix basil puree with nuts, cheeses, and spices. Enjoy, store extras in the refrigerator or freezer. Basil is very easy to grow organically and usually does not get eaten by any pests! Perfect for a small garden or even a pot on your balcony. If you’re looking for something a little more outside of the box, we have a fantastic Kale Pesto recipe from Groundworks Farm. For more local eating inspiration and information on our farm-to-table events, please contact us at inquiry@cateringbyseasons.com or 301.477.3515.